Largest Online Bookmakers (UPDATED 2018) – Looking at today’s betting and gambling industry as a whole, we realize that a healthy competition exists within it. Hundreds of new and established companies work in every way to get our money invested. A number of bookmaking brands, though they seem to be standalone, are a part of some big group. Like other prominent markets, there are some big players in the bookmaking industry while others struggle to gain some benefit. There have been a few new entrants threatening the dominance of the ‘Big 4’ sports betting firms, the latest one being BlueBet (Check out Bluebet Reviews & Bonus Offers). However, it is not true that only the old-established bookies such as Betfred and William Hill stand on the top positions in the list of the biggest leagues. There are some online-only bookmaking companies that have successfully beaten the traditional land-based operators. Some recent mergers involving big companies have also given rise to large bookies. We can expect the bookmaking and gambling industry to be in a balance in the coming future as there is a chance of becoming a monopoly of a small number of huge companies. The online bookmaking industry is evolving with the ascent of newer and more sophisticated technologies, and their loyal customers aren’t that far behind either, there are numerous new strategies, models, and blueprints to game the system, including taking advantage of the bonuses & promos offered to new customers by bookmakers. One of the most popular techniques is ‘matched betting’, which involves the use of free bets offered by different bookmakers in order to place risk-free bets. Here, we consider the top 10 biggest online bookmakers ranked by their volume and review their features, pros, and cons. A well-known name among UK gambling fans, Betsson AB is a Swedish bookmaking company offering a number of online gambling products like sports betting, poker, bingo, casino, scratchcards and more through over 20 online gambling brands such as NordicBet, Betsson, and BetSafe. Passionate sports fans love Betsson’s competitive sportsbook offered through 4000 sports betting channels for amazing pre-match and live betting options. Betsson AB is listed on Nasdaq Stockholm Large Cap as one of the largest gaming groups and leaders in the entertainment sector for five decades. It has been providing secure, rewarding betting experiences to gamblers worldwide and is growing to become one of the biggest European gambling sites. Formerly known by the name Unibet Group Plc, Kindred Group is one of the biggest bookmakers consisting of 11 brands including Maria Casino, iGame, 32Red, and Unibet. This group offers services like online poker, online casino, online bingo and sports betting. The brand is fast rising and with more than 15 million customers, is one of the most favorite online betting sites. This group is the result of Unibet’s acquisition policy that continued from 2011 to 2017, making a stronger operator in the online bookmaking industry. In 2018, Kindred Group launched an online gambling ad blocker tool for customers who like to stay away from gambling advertisements. The future of this brand is bright and clear from their recent takeover histories. A completely modern sports betting company, 888 is a part of the parent company Cassava Enterprises. It started as a casino site and grew gradually with the growth of the internet to become a convoluted corporate structure. 888Casino is a renowned online gambling site owned and operated by 888Holdings. Its poker room branch launched in 2002, 888Poker contributes to the huge revenue generation. The brand also runs numerous online bingo sites. They offer 75-ball and 90-ball bingo games in addition to online slot machines, scratchcards, and progressive jackpots. 888Sport is the group’s sports betting brand that offers sports betting and horse track betting options. Another large sports betting and gaming group operating some of the highly recognized sites in the bookmaking industry such as PartyPoker, Bwin and Foxy Bingo, GVC Holdings Plc works across four business segments such as sports labels and games labels. This brand is a member of the FTSE 100 index and is also listed on the London Stock Exchange. Headquartered in the Isle of Man and licensed in over 18 countries, GVC Holdings Plc employs more than 2800 employees throughout the world. The group operates some of the best online casino and gaming sites including CasinoClub, PartyPoker, Cashcade, and others. Bwin is GVC’s main sports betting brand that offers several sports betting and casino gaming services in many countries. This bookmaker’s journey to becoming one of the largest independent betting brands is more impressive than any other. Starting from a single shop located in Salford, the group today has a multi-billion turnover and up to £1 billion annual revenue generated. The company is based in Warrington and has never been merged or sold. It has remained in the same hand as it was established. The bookie has a vast betting shop operation and has bought about 300 shops from Ladbrokes-Coral. Purchasing the tote in 2011, the brand got a chance to increase its exposure. As in 2017, Betfred runs over 1650 shops in the UK. Preferred mostly for football and horse racing, this bookie offers great range and value on almost all sports. Developed to provide technology-based products and services to the interactive environment and gaming industries internationally, The Stars Group owns and operates gaming and sports betting businesses under the brands like BetStars, the PokerStars Casino, Full Tilt, Poker tournaments, championships, events and live poker tours. The company was known formerly as Amaya Inc. and changed its name in 2017 to the Stars Group. It was founded in 2004 and has its headquarters in Toronto, Canada. As in 2018, the company has acquired UK-focused brand Sky Betting & Gaming and is growing to be stronger and more popular worldwide for poker and sports betting services. When they say it is the world’s favorite online betting brand, they are certainly not lying. Bet365 was established in 2000 from a very small building and has risen to multi-billionaire company generating huge online revenues being the largest private employer in Stoke. The betting group operates as an online gambling platform and offers a wide range of betting services across numerous sports including horse racing, football, cricket, tennis, and basketball. It even owns a football stadium. This bookmaker also offers casino games, poker, and online bingo rooms. Bet365 Group has acquired a great reputation within the gaming and betting industry from players as well as insiders and possesses one of the most loyal customer bases in the world. A bookmaking business created out of the merger of Betfair and Paddy Power in 2016 creating the third largest sports betting brand, Paddy Power Betfair Plc is listed on the FTSE 100 as well as the London Stock Exchange. This group operates under numerous brand names like Sportsbet, Paddy Power, Betfair, and TVG. The business has individual brands in Ireland, Italy and United Kingdom. It operates online, retail, US and Australian divisions. The retail division alone operates more than 600 betting shops in Ireland and the UK. It operates TVG as a horseracing TV channel and pari-mutuel online betting network active in over 35 states. The company also has an online casino and horse racing betting exchange in New Jersey, all of which allow it to firmly establish itself as one of the largest online bookmakers. The second biggest online bookmaker, William Hill Plc is dedicated to providing sports gaming and betting services on an international level. This group, listed on the FTSE 250 index, operates through different segments including online, retail, Australia and US. It runs licensed betting offices providing various services like football betting, numbers betting, horseracing, virtual racing, greyhound racing and more. It offers online gaming and betting services across in-play and pre-match options in addition to gaming machines, bingo, poker and online casino. The company even provides telephone betting services and betting through mobile apps. With more than 2300 high street shops in the UK and 16000 employees, William Hill Plc has successfully dominated the online bookmaking market. The merger of UK’s second and third biggest bookies in 2015-16 created the largest bookmaker in the form of a new company named Ladbrokes-Coral Plc, which generates annual revenue of about £2.5 billion and employs more than 30,000 people. Listed on the FTSE 250 index, the group was taken over by GVC in 2018 accumulating more power at an international level. The oldest betting company in Britain, Ladbrokes as well as Coral possess more than 200 years of experience as a bookie. The group owned about 4000 betting shops and were the most recognized betting brands. The company today has more online customers than any other bookmaking brand and generates about a third of their revenues from digital sources. It’s no surprise that Ladbrokes is currently the largest online bookmaker. 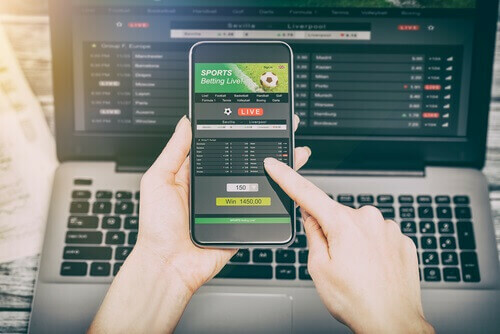 Though these bookmaking giants, with sky-reaching daily volumes, make such high annual revenues, the future of the online gambling and sports betting industry is likely to see new trends with the development of technology. Some of the world’s largest tech companies would emerge as competitors to the established sportsbook operators, fantasy sports sites, and online bookmaking groups. The rise of mobile and speedier internet connection means more people place live bets during events. This trend is sure to continue growing with a large number of betting platforms tailored to such a form of gambling. Punters and gamblers too are getting increasingly sophisticated, constantly developing new models to predict the outcomes of various games, and with increased consistency, allowing them to make a living betting on sports games. Such skill-based gambling isn’t limited to sports, there are a number of poker and blackjack players who consistently win big amounts.